A mule in South Carolina has tested positive for Equine Infectious Anemia (EIA), which is caused by a virus related to Human Immunodeficiency Virus (HIV). The case, in Aiken County, is the first in the state in more than a decade. Testing at two laboratories confirmed the case this week, state veterinarian Boyd Parr said. 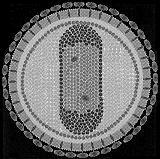 The EIA virus weakens the horse’s immune system, causing disease the same way HIV does in people. While humans are not at risk for infection with EIA, the similarities of EIA to HIV show how serious an infection it can be in horses and why authorities remained adamant about preventing the spread of the disease and attempting to eradicate it from the equine population, Parr said. “This 16-year-old mule is the first equine of South Carolina origin to be initially found positive for EIA since the 1990s,” he said. The affected mule did not show any outward symptoms of its infection. State officials will continue their investigation to determine if other horse may have been exposed that require additional quarantine and testing. The Coggins test is the common name for the laboratory test that determines if a horse is infected with the virus. Veterinarian Leroy Coggins and his research team developed the diagnostic test at Cornell University, in New York, in the 1970s. Its promotion and adoption by animal health authorities around the world has helped reduce the spread of the disease and its impact on the horse population, Parr said. “Many horses in South Carolina have never been tested for EIA and these horses are our highest-risk group for undetected EIA infection,” said Adam Eichelberger, the director of animal health programs in the State Veterinarian’s Office. All horses going to a public assembly in South Carolina are required by law to have a negative test for EIA within 12 months. All horses entering from another state are subject to the same requirement. A negative EIA test prior to a change of ownership is highly recommended, say veterinarians and animal health officials.